Recently I’ve been playing Empire Avenue, an addicting social media stock exchange game where you can trade shares in your friends and companies. Your activity on in the game and with various social media services will increase your stock price as well as unlocking various Achievements which earn you more credits know in the game. 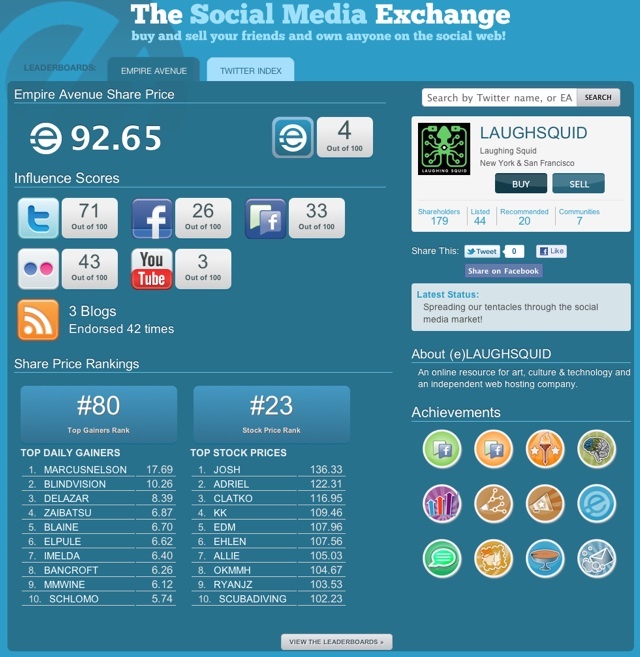 Laughing Squid is being traded on Empire Avenue under the ticker symbol LAUGHSQUID. HRLori is on there as well with the ticker symbol HRLORI. I have a few special invites left, which if used to sign up will give you a bonus 2,000e (credits you can use in the game).